As we continue to populate our site with products, we are also giving some brand new products their debut; on this instance we are introducing the Nebula LED single and the Nebula LED twin. The Nebula LED is dust tight and water jet proof, with an ingress protection rating of IP66. 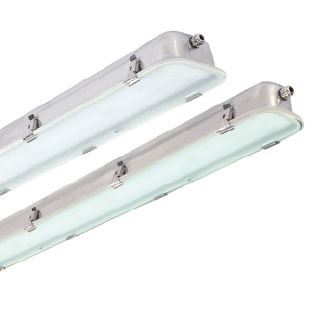 It includes a number of quality linear style luminaires with robust stainless steel enclosure and efficient light sources. The product is very versatile and is available with a wide variety of options to suit the application of the client. Both the Nebula single and the twin are available in 1305mm and 1605mm lengths and both utilise high quality LED printed circuit board light sources. The significance of the use of these LED light sources is the enhanced efficiency when compared to their linear fluorescent counterpart, and the increased reliability with rated lives of 50,000 hours, compared to that of 20,000 hours with linear fluorescent. For further information about the Nebula LED single and twin and its options please visit the Nebula LED product page.